Power 1200W equivalent, actual power consumption about 246W, consumes less energy and much more brighter. Full spectrum, Red: 620-630nm; Blue:450-460nm; White:6000-6500K; Warm white:3000-3200K; IR:730nm; UV:380nm. *280 ~ 315nm: Less influence for plant's growth. *315 ~ 400nm(UV): Absorb less chlorophyll, prevent stem growth. *400 ~ 520nm(Blue): Absorb much chlorophyll and carotenoid, helpful for photosynthesis. *520 ~ 610nm(Green): Absorb little chlorophyll. *610 ~ 720nm(Red): Increase photosynthesis for plants,help growth. *720 ~ 1000nm(IR): Less absorption, effect flowering and seed. Perfect for small Grow Box, Grow Tent, DIY Hydroponics,Bonsai,Garden etc. Comfortable, Humanistic & High-performing ensure that this hydroponic led grow light can rapidly improve the health of plant and growing. Generally more leaves popping up within 2 weeks of using this growing lamp on a daily basis. Suggest distance above plants: 1.2-2m//2-3.5ft. FULL SPECTRUM LIGHTING: The LED full grow light plant includes red, blue, white, white, purple, IR and UV lights: various lights act as natural sunlight, helping plants to grow better and stronger. Ideal assistant for flowers, vegetables, seedlings and more. 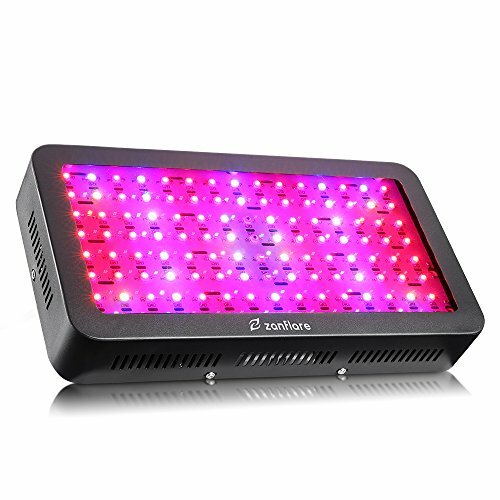 Adopting unique Double-core LED, the grow light is beneficial to promote nearly all types of indoor plants which require a huge amount of light during the different growing phases ( germination, leafing, blossoming and fruition, etc. ). POWERFUL HEAT DISSIPATION: Triple fans are made to cool down the temperature and reduce overheating risks. The growth light features a strong wind capacity, which ensures a quick and great heat dissipation and cools this light down in seconds, prolonging the light's lifespan. SAVE ENERGY, SAVE YOUR BILL: Ultra-low power consumption. Compared with the 600W traditional grow lights, our grow light just consumes only 246W energy, to save power and reduce your electricity bill. Furthermore, it can keep an excellent spectrum lighting similar to the traditional grow light. Try it and see! EASY TO INSTALL: Can be installed anywhere, the hanging kit is included. Find the right place to hang the hook over your plants, just plug the power supply and switch it on, your plants will enjoy the natural spectrum lights and grow better and stronger. WHAT YOU GET: Zanflare greenhouse grow light with 2 years warranty, 100% satisfaction and zero hassle returns guaranteed.